← Ep #32 – Allan Apone & Brad Look Respect The Craft! Contact lenses are pretty easy to find nowadays. It wasn’t always so, and the increased use of lenses has meant an increase in opportunities to have problems with eyes caused by them. Movies have used lenses for a while, and one of the names which lead the way was Greenspoon. I recall watching the credits of The Lost Boys, and the name ‘Morton K. Greenspoon’ etched itself in my head as those bright yellow vampire lenses really did stand out for me as an excellent example of what a lens can do. Read more on the history of lenses in this report here at Optometry and Vision Science. Click on the link which says ‘Article As PDF’. If no joy get it here. It is surprising how far back it goes, and the name Greenspoon is there! I was thrilled Cristina mentioned him in the podcast. Cristina gets busy on The Walking Dead. Those milky eyes and bloodshot orbits are a big part of the grim effects workload. We chatted to Cristina Patterson of Eye Ink FX about eye care and lenses, especially in the light of many people around us who had created characters for Monsterpalooza using lenses. Many conventions will have extensive makeup characters with lenses bought online or in costume stores for not a lot of money. These lenses may be available in stores, but is it wise to buy and use them? We drill deep and talk about the things that matter with eyecare and lenses, with a mind to the professional makeup artist who may be pressured into supplying and fitting lenses as an afterthought or as a cheap alternative to using a lens tech. 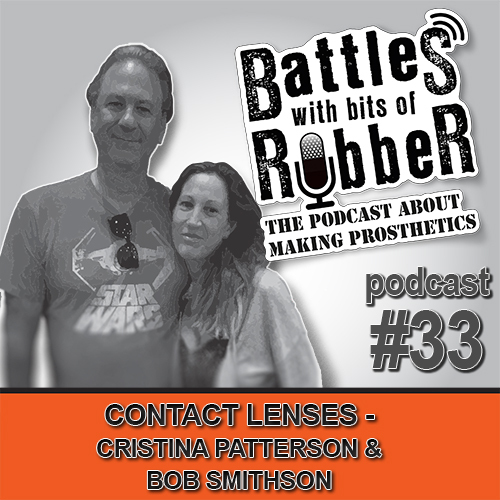 We also chatted to Bob Smithson, a lens tech with many years experience fitting lenses on set and dealing with the front line of lenses on a production. Bob drops some magic into the eyes of Foo Fighters’ Dave Grohl as The Devil for the Tenacious D video ‘The Pick Of Destiny’. The bottom line is there are risks whenever you put something into the eye, and it pays to know the lenses are from a legal and reputable supplier and that whoever fits them is qualified and insured to do so. It’s an expensive thing to get wrong! I’m aware that of course it is beyong most casual budgets to pay to have lenses specially made and fitted, but that doesn’t mean problems you may encounter from ill fitting or bad lenses will be any cheaper for finances or reputations. Of course corners are cut and if you are taking chances with your own eyes then it’s on you. I guess what I am saying is that you must not take that route if working on someone elses eyes. Especially if they can sue you.